Free Building Fun This Saturday!! Looking for something fun to do this Saturday morning with the older kiddies? Do you have Home Depot nearby? If so you are in luck!! This Saturday they are holding one of their Free Kids Workshops!! Head on over to The Coupon Geek for all the details!! Cheap Capris....Run to Old Navy!!! Ah, yes Old Navy is at it again with another great deal!! Stop by your local Old Navy store starting this Thursday 7/2 through Saturday 7/4 for their Weekend Wonder Sale! All Capri's for Women and Girls will be just $9 a pair!! My best advice is to get there early for best selection....as if it is anything like the $2 tank or $1 flip-flop sale they just recently had there were tons of people there!! Also, don't forget for even more savings.....be sure to visit here to print of a 15% or 10% off coupon!! Sign up here to receive a FREE sample of new Kotex Ultra Thin Overnight with Wings courtesy of Walmart. These freebies usually go fast...so sign up before they are gone!! Interested In Taking In a Game This Tuesday?? Looking for some fun for the whole family to enjoy on the cheap? Well if you like baseball, and are free this Tuesday night then your in luck thanks to Kraft Singles!! Simply purchase a package of Kraft singles, save the wrapper then head on over to your local Minor league baseball ticket window and receive a free ticket when you purchase one at regular price!! Offer valid on participating teams Tuesday night home games ONLY now through September 1, 2009. Ticket offer is not valid in Allentown, Dayton, Indianapolis, Lake Elsinore, Pasco, Portland OR, Reno, Spokane,Tacoma, and Vancouver. To find a minor league team near you click here. Although summer has really just begun it's already time for the summer clothing sales to begin!! Hey, that's good for us...savings, savings, savings, right? Old Navy is currently running a Hottest Summer Sale...with prices up to 50% off summer styles throughout the store!!! Plus, now through July 2nd, Old Navy Cardholders can save an additional 25% off your entire purchase both in-store (no coupon needed, just pay with your ON card) and online by using coupon code THANKYOU25 at checkout. Free Iced Blended Drink This Wednesday!!! That's right stop by your local Coffee Bean & Tea Leaf location this Wednesday, July 1st from 3pm-7pm for a FREE 12 oz. Instant Karma (Nutty Creme' Carmel) Iced Blended Drink!!! No purchase necessary. Offer while supplies last. With all freebies...probably best to call ahead to be certain your local store is participating!! Heading Over to Bath & Body Works? If so here is a great coupon to take along to the store with you!! Get a FREE Antibacterial Foaming Hand Sanitizer with any purchase at Bath & Body Works now through this Sunday July 5th. There is no minimum you must spend to use this coupon either..a BIG plus!! Feeling Hungry? Grab a Friend and Go!! To Quiznos that is....here is a printable coupon for a FREE sub of equal or lesser value when you buy one at regular price and a regular fountain drink. Offer excludes Toasty Subs. Well, the 4th is fast approaching and if you'd like to have some Baked Beans at your holiday BBQ here is a great coupon in the nick of time!! 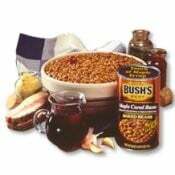 Here is printable for $1.00 off 2 cans of Bush's Baked or Grillin' Beans (22-28 oz. can). Match this coupon with the $2 a can sale price at ShopRite this week and you have yourself some yummy, cheap beans this holiday weekend!! Coupon expires 11/30/09...so plenty of time to use....best to print out now though, as they are usually popular coupons and will probably be gone in no time!! Free NASCAR When U Purchase Reynold's Wrap?? Reynold's Wrap is currently running a promotion for a FREE Reynold's Wrap Die Cast Car by mail when you purchase any 2 Reynold's Wrap Foil products. (Offer excludes the purchase of 20, 25, and 30 square foot rolls) Both items must be purchased in the same transaction between 6/1/09 and 4/30/10 or while supplies last. All you have to do is send in this form here completely filled out along with the UPC's from each package and your original store receipt with qualifying items circled. There is a limit of one car per household or address. Your car should arrive in 8-10 weeks. Note: This is a great rebate to take advantage of if you have a ShopRite nearby!! Check out their weekly Reynold's Wrap deal here. I know my Little Man will be excited to receive this cool freebie in the mail!! Family Fun Magazine On the Cheap!!! Are you always looking for cool new fun things to do with the kiddies? Maybe looking for a few tips on how to throw an amazing kids party? Or perhaps cool crafts for the kiddies to make? Well, Disney has a great magazine called Family Fun....it's full of all those above things...plus much, much more!! A magazine perfect for parents of little ones...who like to keep busy and get creative!! Right now Amazon has a one year subscription (10 issues) for just $5.00!! That's less than 50 cents an issue. 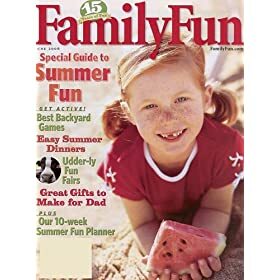 We currently receive Family Fun magazine....actually is was a gift subscription from a family friend, and we have tackled many of the crafts and used many of the ideas to add a little more fun into our world. You can never have too many fun things to do with the kiddies!! Sound pretty yummy, right!! Head on over to Ben & Jerry's any Monday now thru August 31st and get a FREE sundae when you buy 1 at regular menu price!! No coupon needed either...just ask for this great deal when ordering!! Now that's what I call an great Monday deal!! Probably best to call you local B&J shop to be certain that they are participating!! Here are the best deals for ShopRite this week. Just in time for the nice long holiday weekend!! See any other great deals at ShopRite this week? Leave a comment to share what you've found!! Wegmans Ground Beef Club Pack (90% Lean) $1.99 lb. Wegmans All Pork Italian Sausage Club Pack $1.99 lb. See any other great buys at Wegmans this week? Leave a comment to share what you've found!! Assorted Lays and Ruffles Chips (9.5-12 oz.) B2G1 FREE! Pay just $3.00 for 4 cans!!! See any other great buys at Dollar General this week? Leave a comment and share the deal you've found!! Here are eight different $1 off Organic Valley coupons for various dairy products....everything from milk to cream cheese and more!! All coupon can each be printed twice and they expire 30 days from print date. Thanks to Julie for the heads up on these great printables!! Ahh...yes a new way to save at Genuardi's!! Let me introduce to you...Coupon Link. Now you can easily load digital coupons from Cellfire, P&G Brands, and Shortcuts.com right to your Genuardi's Club Card to save big on items you buy!! It's very easy to do!! You simply select the coupons you'd like to add to your Club Card online and then at checkout in-store watch the discounts automatically deduct from your total. No clipping coupons, no filing involved!! The coupons stay on your card until they are used or until their expiration date. You can also print coupons if you'd prefer and take them in-store for redemption as well. Check out all the current printables here. You can view all the current digital coupons for Genuardi's here. Remember to check back often for new coupons!! Save an Extra 20% Off Online Today & Tomorrow ONLY!! Save an additional 20% off today and tomorrow only at Kohl's .....all from the comfort of your own home. Online shopping.....What could be nicer? Simply enter coupon code TWENTY4U at checkout. Not to worry you can use 2 promo codes per order at Kohls.com. Offer valid online only. Plus, remember for every $50 you spoend now through June 30th you get back $10 in Kohl's Cash!! You may want to head on over to your local GAP store....Starting today through July 2nd they are having a BIG $19.99 a pair Jeans Sale!! The sale includes both Men's and Women's jeans in select styles. Jeans regularly priced at $49.50-$69.50. Before you know it it will be jean wearing weather once again....so a great time to stock up when the prices are low!! Here are the best buys I see at Acme Markets this week. Sale starts today!! Note: If you have duplicates of these coupons savings will be greater!! Plus receive a coupon for a FREE gallon of milk on your next visit!! See any other great buys this week at Acme? If so leave a comment to share the great deal you've found!! Here are the best deals for Genuardis this week. Sale starts tomorrow, Friday 6/26. Note: Savings will be greater if you have duplicates or both of these coupons!! See any other great deals this week at Genuardis....leave a comment and share what you've found!! Here is a coupon for a FREE 12 oz. beverage at a Seattle's Best Coffee Cafe inside Borders. Coupon is valid starting tomorrow 6/26-7/2 and is limit one per person. No purchase necessary. Well, here's is an idea.....head to Einstein Bagels. If you have one nearby that is!! Click here for a printable coupon for a Free lunch entree' or salad when you purchase one at regular price!! Perhaps treat your friend on this fine Thursday afternoon. Or hold on to it....it does not expire until 7/3/09. Been wanting to change the color of a room in your home, just not had to time get around to it yet or not sure just what color to choose? Well....here is a head start!! 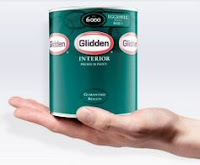 Glidden is having a National Paint Giveaway.....where you can receive a free quart of Eggshell Glidden paint. Simply pick out your color, fill out a form with your mailing info and your sample will be mailed to you in about 3-4 weeks. Offer valid through July 2, 2009 or while supplies last. Limit one per household. No rooms to paint? Be creative..Maybe there is a craft or project you can use it for? Activity Sheets 4 The Kiddies...Coupons 4 You!! How about some activity sheets for the kiddies to keep busy with? Now that summer has arrived it's always a great idea to have fun activities for the kiddies to do!! Sign up here (by checking the box) to be an Organic Valley Farm Friend and they will send you not only activity sheets for the kiddies but also a welcome kit with coupons for various Organic Valley products. Offer valid only in the US. 'Tis the Season For Allergies!! Build That Playlist 4 Free!! Summer Fun at Coco Key 4 Less!!! So.....They Think It Was a Spider??? Fun at 4 a Later Date?? Take a Friend 4 Free!! Free Beverage at Orange Julius!!! Time 2 Print Those Prints!!! 2 Help The Kiddies Stay Cool This Summer!! Have You Tried Kraft Bagel-Fuls Yet? Pick Up Stix Coupon: The Real One!! DS Games On the Cheap!!! 1/2 Off All Men's Stuff!!! Head 2 Staples If your Outta Paper!! A Perk to This Monday Morning!! Reminder: Free Ice Cream Day!!! 50% All Thomas & Friends!! !